Only old farts like me remember anything about LORAN (LOng RAnge Navigation). My familiarity with it came not from boat navigation, but from airplane navigation. Before LORAN became totally obsolete due to GPS (phased out in U.S. and Canada in 2010), the transmitter stations were commonly tuned in in order to obtain positional fixes via triangulation. Whilst taking flying lessons at Lee Airport, in Edgewater, Maryland, the ground instructor included it in the lessons, and even the FAA Private Pilot exams had a question or two on LORAN. The el cheapo Piper Colts that I flew were luck to have a VOR receiver in it, so I never actually used LORAN. 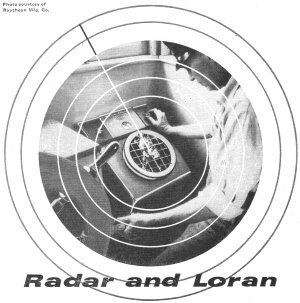 This article touches on the principles of both radar and loran. FOR MORE than a decade, the navigator has had electronic eyes which penetrate fog and darkness, seek out hidden dangers, and chart the surroundings for him. Radar (Radio Detection and Ranging) was a secret word during the early part of World War II and has been credited by many as having been most instrumental in bringing victory to the Allies in Europe and the Pacific. 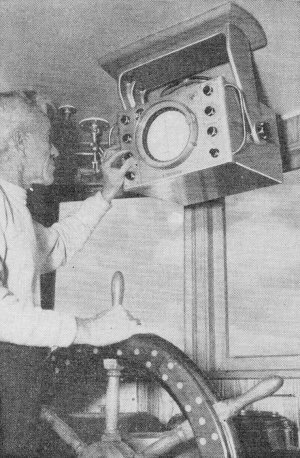 Loran (Long Range Navigation) was also developed during World War II as a rapid and simple way of getting accurate navigational fixes. Today more and more standard navigational charts have loran lines, making it possible to transform a loran receiver reading directly into a graphic navigational fix. 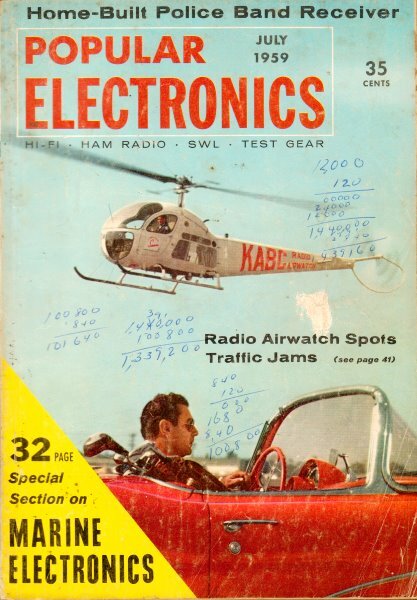 A crude form of "radar" was in use before electronic radar came into being. From the beginning of time, navigators have used audio signals to determine their distance off steep shores hidden in fog, by sounding a short blast with a whistle or horn and then listening for the echo. Knowing the speed of sound to be approximately 1100 feet per second, if it took five seconds for an echo to return, the shore or cliff was known to be about a mile away. A radar unit transmits short bursts of microwave radio energy (between 1000 and 30,000 megacycles) which are reflected by solid objects. Distance is determined by the length of time it takes a radar pulse to hit a target and return. Since radio waves travel at the speed of light - 186,000 miles per second-the time from the instant a radar pulse is transmitted to the instant the echo returns is' measured in microseconds (millionths of a second). In a typical radar unit, more than a thousand pulses per second are transmitted in rapid succession as if fired from a machine gun. The pulses are spaced far enough apart in time to allow an echo to return before the next pulse is transmitted. The time required for a pulse to travel to a target and return as an echo is measured on a cathode-ray tube, similar in many respects to a TV picture tube. The echoes appear on the round screen as glowing "blips." Antenna Requirements. Radar pulses should travel in a narrow beam in order to allow the detection of small objects and the determination of direction as well as distance. A modified form of parabolic reflector, the so-called "dish" antenna, is used to focus microwave signals into a narrow beam. The antenna is rotated 3600 horizontally so it can scan in all directions, and the antenna rotator motor is synchronized with another motor at the radar screen. As the antenna rotates, the trace line on the radar screen sweeps around with it. This is done by rotating the magnetic sweep coils around the neck of the cathode-ray tube. The sweep starts at the center of the round tube face and rotates in step with the antenna. It looks something like a windshield wiper. Blips appear along the trace whenever a radar echo is received. A long-persistence picture tube is used, so that the echoes remain on the screen until the sweep has rotated a full revolution and sometimes longer. As the radar beam rotates, a map of the surrounding area is "painted" on the screen. Large areas, such as the shoreline and islands, appear as large lighted masses. Boats and other small objects appear as small blips. Lighter hash or clutter may appear near the center of "home" point on the screen due to "sea return," a mass of echoes from the surface of the water. 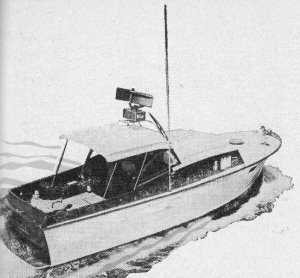 Although marine radar equipment some­times has a range up to 40 miles, maximum range is limited by the height of the antenna above water. Radar is a line-of-sight device, and as the antenna height is decreased, the effective range is reduced. While it might be interesting to see objects 20 miles away, objects within a range of eight miles are generally of more concern to the navigator. Typical Installation. A marine radar installation consists of a transmitter, receiver, antenna, monitor, and power supply. One antenna serves both transmitter and receiver since the transmitter is turned on for only a microsecond or so and then pauses to allow the receiver to intercept the echo. The antenna is automatically switched from the transmitter to the receiver electronically. Use of radar on pleasure craft is limited by space, the capacity of the electric power source, and the owner's pocketbook. Prices for radar units start at about $1500. Power requirements are heavy, running from 300 watts to more than 1500 watts, which means that small boats equipped with 12- volt batteries may not have enough reserve electrical power for radar equipment. An auxiliary generator driven by a small engine can be used if a boat does not have 32- or 115-volt batteries. An FCC radio station license is required and the radar equipment must qualify for FCC type acceptance. It must be installed and serviced under the supervision of a person holding a suitable FCC operator's license endorsed for radar. The master of a vessel, however, may use a licensed radar set without being required to have an operator's license. No one else may use the radar except under his personal supervision. Conventional navigational devices such as radio direction finders are being supplemented on military and commercial vessels by loran, with its longer range than a conventional radio direction finder, no loop to rotate, and greater accuracy. Like radar, loran employs pulses, but operates at much lower frequencies (1750-1950 kc.). Loran, however, does not require a transmitter on board ship. 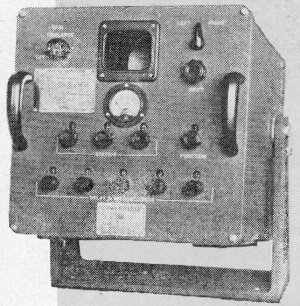 Sometimes called an "electronic stop watch," loran measures the difference in the time required for radio signals to arrive from different synchronized radio stations. Since radio waves travel at constant velocity, the traveling time of a signal is proportional to the distance between transmitter and receiver. Chain of Operation. A loran chain consists of two or three radio stations, a "master" and one or two "slaves." These transmitters are located from 200 and 400 miles apart and transmit short pulses simultaneously or offset by a precise time interval. The pulses are repeated between 25 and 35 times per second. The difference in arrival time of signals from a group of loran stations is measured by a loran unit aboard ship. To get a "fix," it is necessary to take readings on two pairs of loran stations or a single three-station loran chain. The ship is located at the point where the hyperbolic curves or distance lines on the loran chart intersect. Daytime range of loran is around 700 miles over water and about 450 miles at night, using the direct ground wave from the loran stations. At night, the reflected sky wave permits use at distances up to 1400 miles, but the results are less accurate. Error in line position of up to ±3 nautical miles and in fixing of up to ±10 nautical miles is apt to occur in using night sky waves at extreme distances. Power requirements for loran are more modest than for radar (as little as 135 watts), but the cost of the equipment is about the same, starting at around $1500. For reliable fixes in all kinds of weather, loran is of great importance to the boat­man who ventures offshore beyond the range of radar or direction finders.